The problem is fixed in Java 9 and in Java 8 update 152. 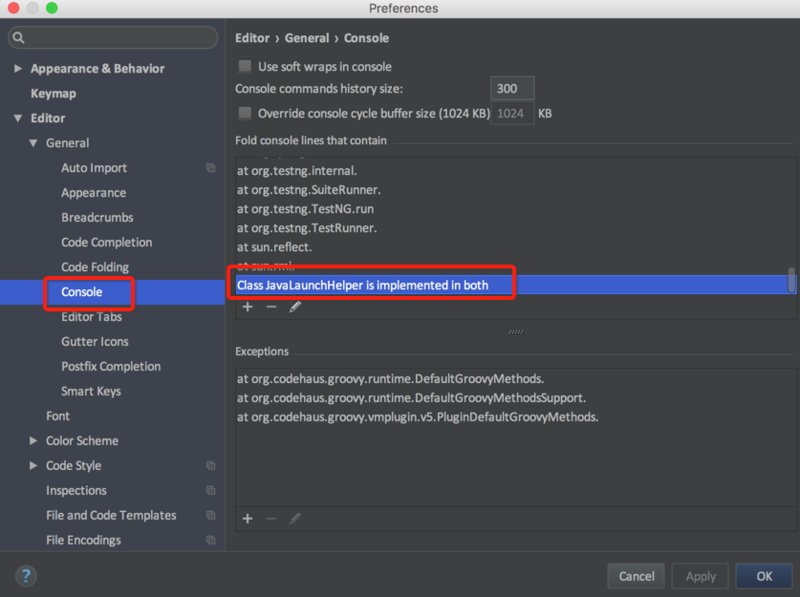 If it annoys you or affects your apps in any way (it shouldn't), the workaround for IntelliJ IDEA is to disable idea_rt launcher agent by adding idea.no.launcher=true into idea.properties (Help | Edit Custom Properties...). The workaround will take effect on the next restart of the IDE. I don't recommend disabling IntelliJ IDEA launcher agent, though. It's used for such features as graceful shutdown (Exit button), thread dumps, workarounds a problem with too long command line exceeding OS limits, etc. Losing these features just for the sake of hiding the harmless message is probably not worth it, but it's up to you. Of course, you can use 【Find Action...】(cmd+shift+A on mac) and type Fold console lines that contain so as to navigate more effectively. This happened to me when I installed Intellij IDEA 2017, go to menu Preferences -> Build, Execution, Deployment -> Debugger and disable the option: "Force Classic VM for JDK 1.3.x and earlier". This works to me. I have found the other workaround: to exclude libinstrument.dylib from project path. To do so, go to the Preferences -> Build, Execution and Deployment -> Compiler -> Excludes -> + and here add file by the path in error message. Downloading and installing JDK 9. Note that the next time you create a new project, or open an existing project, you will need to set the project SDK to point to the new JDK install. You also may still see this bug or have it creep back if you have JDK 1.7 installed in your JavaVirtualMachines folder (which is what I believe happened to me). Not the answer you're looking for? Browse other questions tagged java macos intellij-idea or ask your own question. How are JDBC drivers loaded without Class.forName() or System Properties?